It appeared to be a slower week. I don't believe it has as much to do with the fishing, as the number of anglers out on the lake. Still some nice 3 and 4 pounders were reported at the general store. 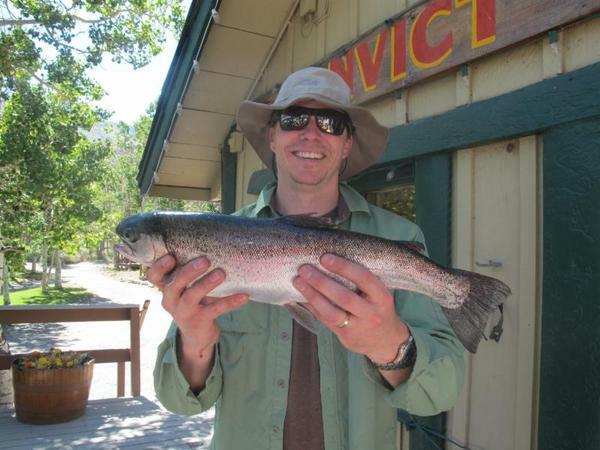 Next week we will be stocking trophy trout before the Labor Day Weekend. This will kick off our fall stocking schedule where the resort will stock the lake with trophy trout about every 2 weeks until the end of the season. Catch of the Week: Angler Pete from Wisconsin landed this big boy while fishing with Joe Contaldi of Performance Anglers Guide Service. It was a 4 pound 10 ounce Rainbow. There were 5 anglers on the trip, with a total of 34 fish to the net. Al Tlumac of Huntington Beach, CA with a fat 4 pound 4 ounce Rainbow. Al caught his fish at the Inlet with a Nightcrawler. Angler Dan from Wisconsin also landed a nice fish while fishing with Joe Contaldi of Performance Anglers Guide Service. It was a 3 pound 1 ounce Rainbow. 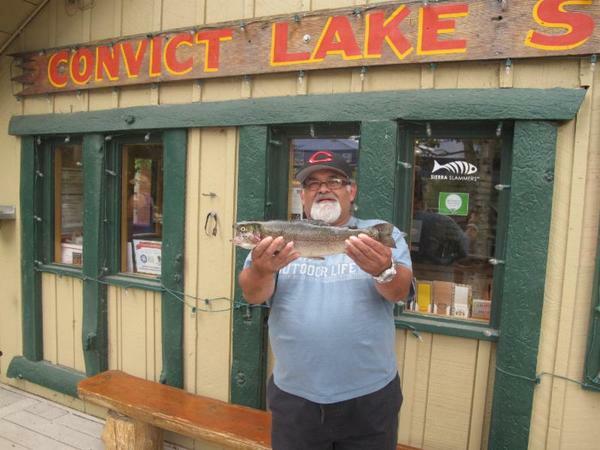 Fred Bega of Riverside, CA hooked into a 3 pound Rainbow using Rainbow Powerbait. He was fishing at the Inlet. Tactics/Bait: The most successful Powerbait color was Rainbow. Nightcrawlers like always worked well. The Inlet was the hottest spot this week. Other locations fishing well were the South Shore, North Shore, the Handicap Pier and Hangman's Tree. Derby News: The Ambush at the Lake fall fishing derby will be starting on September 5th and run until the end of the 2016 fishing season. Don't miss out on the chance to win $6,000 in Resort prizes! The Morrison Bonus will be on the weekend of October 28-30. $2,200 in cash prizes. Weather: The forecast for next week is calling for mostly clear and sunny skies The high temps starting Monday will be in the mid-70s and the lows will be in the low-50s. Here is the National Weather Service link that is usually quite accurate: 7-Day Forecast Convict Lake. Sunrise - Sunset: Sunrise this week 6:22am - 6:27am and Sunset 7:33pm - 7:24pm. 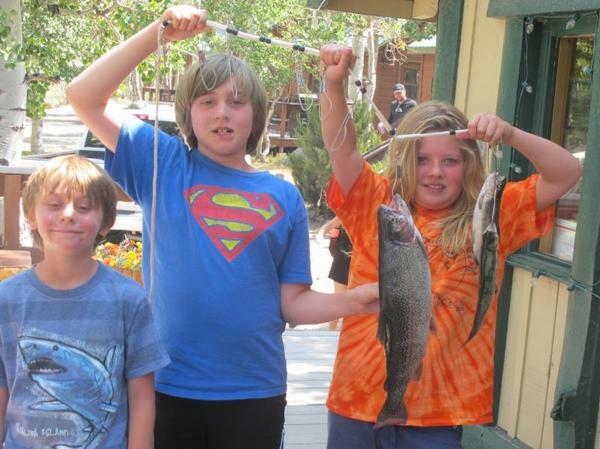 Stocking: The resort is scheduled to stock trophy trout on September 1st. The DFW is scheduled to plant both the lake and creek the week of August 28th.